So while this tender turkey meatball recipe is pretty different – certainly in spirit – than my Classic Meatball recipe, it’s a keeper. And not just for my Hungry Boys and sentimental self. For you, too, because these turkey meatballs are super tasty, easy to make, and use only the most basic pantry staples and take 5 minutes to prep. Any family cook can tell you that you’d be wise to keep a recipe with that list of attributes close at hand at all times. Ketchup or not. Step 2: Put a pot of sauce on the stove. I keep homemade marinara in the freezer. If you don’t have or want to make homemade, look for an all-natural jarred sauce (the higher quality sauces tend to be a bit more expensive, but are worth the extra cost when feasible). 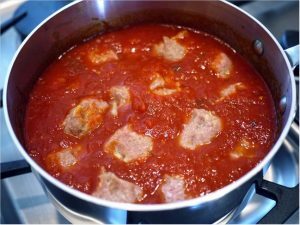 Use a pot that will allow your sauce to come up the sides at least 2 inches so that the meatballs will be mostly submerged during cooking time. Step 3: While the sauce is heating up, roll a palmful of the meat mixture into a ball about 1” in diameter. Repeat until all of the meat mixture has been made into meatballs. Get your kids in the kitchen! Even little ones can help with this step. Step 4: Carefully place the meatballs in hot sauce and simmer, with the lid on, until the turkey meatballs are cooked through, at least 12 minutes or so.